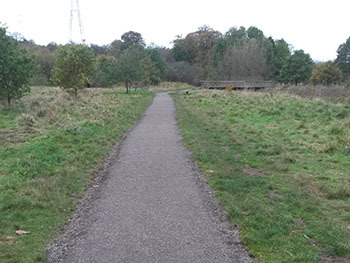 The Original Paths and track at Macclesfield Riverside Park were put in in the 1980's and are showing their age. The crushed sandstone is being replaced with a material known as Hop Path made from recycled road planings. This has been used on the Lymm Railway Line and provides a good durable surface. The work is ongoing and we thank the visitors to Macclesfield Riverside Park for their patience whilst the work is being completed. 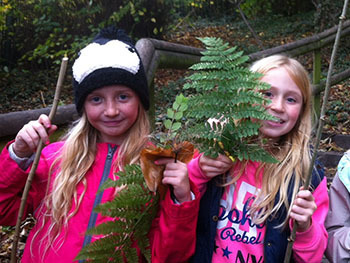 The Autumn Crafts Event has once again fully booked.Fifteen children collected natural materials from Macclesfield Riverside Park (pictured to the left). These were used to make a number of different crafty items including dream catchers and catherine wheels. 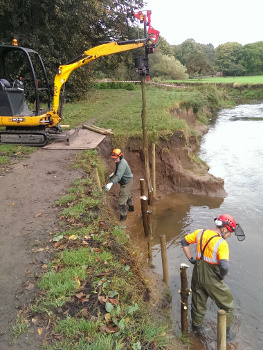 River Flow deflectors installed at the Carrs, Wilmslow. To protect the recently improved multi-user path through the Carrs river flow deflectors have been installed. These now divert the flow of the river away from an area where the River Bollin had started to erode the bank near the track. A section of willow spiling has been added to help stabilise the bank. The picture to the left shows live willow posts being knocked in for the spiling. 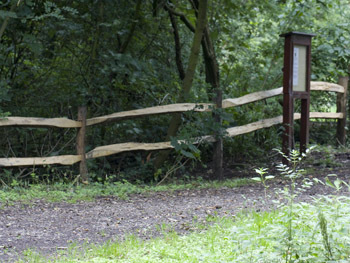 The work was funded by Cheshire East’s Public Rights of Way Unit and was organised by the Bollin Valley Partnership on behalf of the Friends of the Carrs. The larch trunks used were felled at Rossmill as part of woodland improvement works taking place there and it is good to see them being put to good use within the valley. 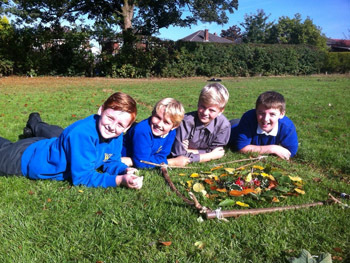 The beginning of October saw our annual sustainability week in the Bollin Valley. Each year we organise a series of workshops in schools to inspire children to think more sustainably. This year we ran 25 workshops in 11 schools with activities ranging from making skipping ropes from plastic bags and finding alien invaders in schools grounds to making seed bombs and extracting honey. The 900 children involved were all aged between 4 and 11 years old from Cheshire, Trafford and Manchester. The local Rare Breeds Sale at Chelford Cattle Market is an important time for the Bollin Valley rangers as the proceeds contribute to the funding the Countryside Management Services provided by the partnership. Seven of our cows and four of our calves were entered into the Show and Cattle Sale on Saturday. All the animals sold and Bollin Judy and Bollin Isabel came first and second respectively in the Longhorn Class. 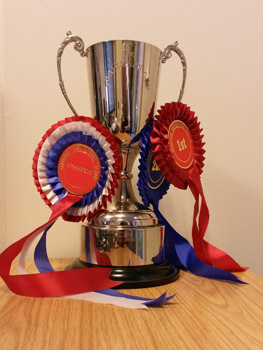 Bollin Judy was also awarded Overall Champion at the show and the cup won is pictured to the left. The cattle sold will be joining herds in the Derby and Leicester areas. 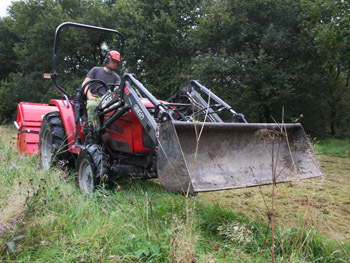 As part of the ongoing Woodland Improvement Grant awarded by the Forestry Commission for work at Rossmill Woodland the two wildflower meadows were cut today by contractors. The cuttings were collected and removed from the meadow to help encourage the wildflowers already in the meadow and to allow their seeds a better chance to germinate. Later in the year, funded by the same grant, we will be carrying out more tree work at the motorway end of the site and continuing the hedge laying around the lower meadow. 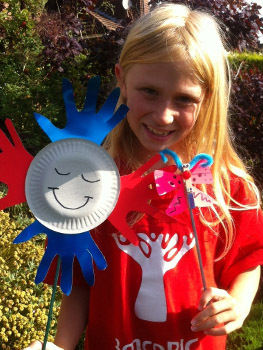 Crafts activities on an ecological theme were enjoyed by children on this fully booked event. Camouflaged caterpillars and sunshine mascot (shown in the photograph to the left) were made followed by a wildlife walk into the park to look for bees and butterflies. Work on replacing an old barbed wire fence with a traditional cleft rail fence has now started. 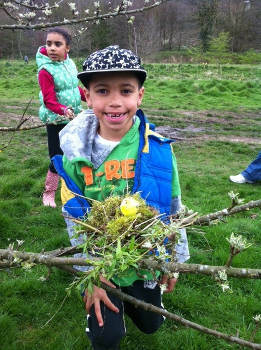 This project is funded by a Woodland Improvement Grant from the Forestry Commission. Later this year we will continue the hedge laying, wildflower meadow management and the removal and replacement of some inappropriate trees. The sun shone on our annual 'Countryside taster Day'.This event is open to all people with a disability and aims to give a taste of the countryside to those who might normally find it hard to access. This year we had over 300individuals attend from twenty different organisations. We would like to thank the forty plus volunteers that made this event happen on the day and our hosts, Beech Hall School. 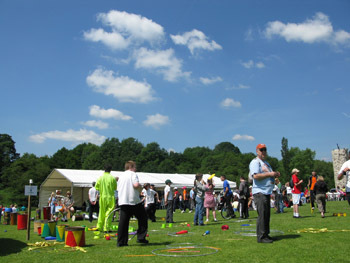 The volunteers provided events such as archery, pony trap rides and pond dipping. Thanks is also due to the Co-operative Bank, Macclesfield and District Lions and Magpie. We have replaced the footbridge over the stream at Wilmslow Park. The old one had definitely reached the end of its useful life. 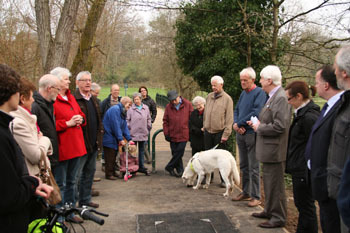 The new bridge was constructed off site to minimise the disruption to local users of the Park and to walkers on the Bollin Valley Way. 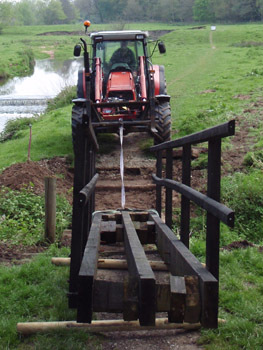 The photograph to the left shows the new bridge being pulled into place across the stream. The weather was kind to us so we were able to spend the afternoon outside on scavenger hunts, nest building and finding Easter bunnies. The event was very popular and was fully booked with over a week to go. The new online booking system made it more convenient to book onto the event. Keep an eye out for our Summer and Christmas Crafts events later in the year. 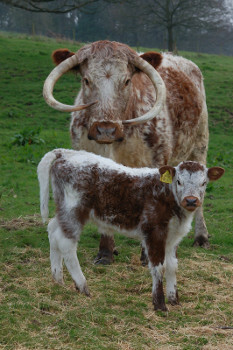 The first of this years calves Bollin Orchid (pictured left with her mother Gertrude) was born on the 24th March. This year all our calves will have names beginning with 'O'. So far we have also had Odin, Olga and Otto. We would welcome any suggestions for calf names for any other calves born this year. An informal ribbon-cutting ceremony was attended by many of those who had been involved in its creation. This has truly been a Partnership project with landowners Cheshire East Council managing the project, Friends of the Carrs applying for the grant, the Bollin Valley Partnership getting the community on board and the wider public supporting the scheme with letters and campaigning. The main path runs alongside the River Bollin from the bridge near the Parish Hall to Twinnies car park, where it meets the recently upgraded Kings Road to Lacey Green link.Additional resurfacing and widening work has been completed by Cheshire East Council on the sections of path that link to Hawthorn Lane and to Cliff Road, providing flexible access to and from the town centre. The sustainable transport charity, Sustrans, hopes to designate the upgraded paths as part of the National Cycle Network,linking to the nearby Airport Orbital Cycle way. The new 2014 Bollin Valley Events Programme has just been published on this website. This year we have switched to online booking using Eventbrite. This should make booking onto events even easier. The programme includes a wide range of activities including our Easter, Summer and Christmas craft events; folk law, halloween and wildlife walks and practical conservation tasks. 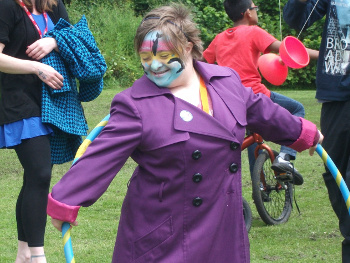 Pictured here is our annual Countryside Taster Day forpeople with disabilities. Ranger Jim Middlemass prepares the ground ready for sowing the wildflower meadow at Macclesfield Riverside Park.This year, to mark the Centenary of the start of World War I, we are sowing a mix heavy in poppy seeds as an act of remembrance for the many who were killed or injured during the war. There will also be a similar area of wildflower meadow sown at the Carrs in Wilmslow. Many hands (and a few chainsaws) made light work of laying over one hundred metres of hedge. 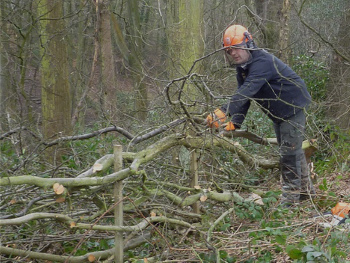 Bollin Valley Rangers were joined by Cheshire East Rangers and volunteers for a day of hedge laying alongside Tytherington Wood in Macclesfield Riverside park. 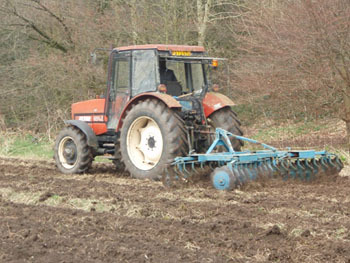 The work is part of a Woodland Improvement Grant funded by the forestry Commission. 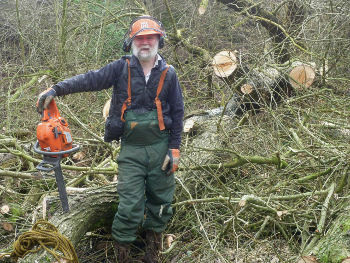 Pictured left is Cheshire East Ranger Martin James showing off his hedgelaying skills. Over the last week Rangers have been busy across the valley making safe hung up trees and clearing paths blocked by fallen trees after last Wednesdays storm. Pictured to the left ranger Euan Murray takes a breather after clearing a large snapped off crack willow at Rossmill Woodland in Hale, Trafford. Bollin Valley’s cattle graze our countryside parks and help us in the conservation management of wildflower rich meadows. We are delighted to announce that it is now possible to buy beef from our pedigree herd of old English longhorn cattle from S & D Kirk Butchers on Hollin Lane, Styal. Their shop is less than a mile from our farm so this is truly local food. 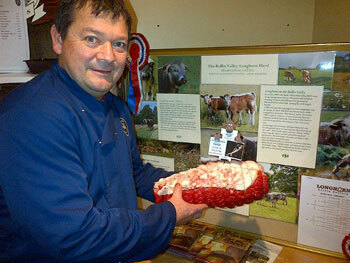 Longhorn meat is considered amongst the best, if not the best beef grown in the British Isles so why not why not pop in and see David Kirk for helpful tips and suggestions on how to serve up a fabulously tasty and highly nutritious meal.